Uber has taken over the taxi world, Airbnb has opened doors (literally) to millions of travellers and Deliveroo brings restaurants to your doorstep. They all did so in record times, using the latest technology to take their markets by storm. And not just locally. All over the world. With rapid international growth and a ‘revolutionary’ way of thinking, could Wheelys Cafe be following suit? Controversial, exciting, new. These are a few ways you could describe the brand image Wheelys has created for themselves. Challenging international brands with a fresh concept and new ways of thinking. They’ve made it easy for anyone—you, me, your great-aunt—to become their own boss and run a mobile, organic cafe on the streets of their home town. But how? First let’s talk about what Wheelys actually is. Wheelys Cafe is a brand that started in Stockholm, serving coffee and snacks from a custom made solar and leg powered bike. This makes them cheap to start (compared to franchising) and extremely versatile. You could be serving coffee at the train station in the morning, in the park at lunch, and outside the football stadium in the evening. Wheelys allows you to go where the people are, rather than the people coming to where you are. And convenience is a major factor in consumer purchasing. Okay so we get how it works. But will it? The cafe market is extremely saturated, with some of the world’s most recognisable brands reaping billions of dollars of profit each year. But Wheelys has branded themselves as an organic business. And with the rise in consumer awareness towards ethical sourcing and employee welfare, they are ahead of the game. However, this doesn’t mean independent coffee shops (or chains) can’t join in on the action. So what can you do? If you sell organic, fair-trade or locally sourced produce, shout about it! Let your customers know you’re supporting your local farms or suppliers, as well as people in other countries. 76% of Gen Z (those born after 1995) say they are worried about humanity’s impact on the world. This is creating a market crying out for responsibly sourced goods. Especially in the food industry. So if you aren’t currently offering an organic option on your menu, now is the time to start. You can start by using coffee cups made from sustainable materials and buying fair-trade coffee beans. Eco-friendly consumables are an affordable and good-karma way of enticing Gen Zers to your coffee shop. Cleaning up can be an environmentally friendly task too. Using products without chemicals in, such as Ecover, is another positive way you can maintain custom when Wheelys begin popping around your town. How Much Does a Wheelys Cafe Cost? Bike prices range from $3000 to $9000 (around £2,500 to £7,400). And that doesn’t include the $700 delivery. Or the $200 a month franchise fee or any permits you have to get from your local council. Or, surprisingly, accessories such a manual grinders and siphons. And as anyone can buy a bike and start selling coffee, you might find strong competition in your city will begin to lower your profits. Let’s do the math. Selling 250 cups of coffee a day is a good day at an established drive-thru cafe. Let’s say you buy a bike and start selling around 100 cups per day. Wheelys put the cost per cup at around 24cents (20p) and suggests a retail price of $2 (£1.63). 100 cups at £1.63 minus the 20p per cup is £143 a day. That’s £715 for a 5 day week. £3,098 a month. Seems like a lot, but don’t forget you will need to factor in the 5% fee on all transactions through the app, restocking, permits, the franchise fee and any days off or slow days you might have. Wheelys supply you with a stamp for branding your coffee cups and lids, which you can buy from Nisbets to help with expenses. If you already run a cafe, you could create your own bike which you can use all year round. Adding a trailer to a bike is an easy and extremely affordable way of mobilising your coffee. You could even start to do deliveries to local business from your very own coffee-chariot. Brand it the same as your shop and not only will it help you increase sales, but will act as advertising whilst you’re out-and-about. You may even see this flourish into a viable venture and could end up using a van to make deliveries. Already a Coffee Shop Owner? How will this affect those of you with your own coffee shops on the high streets? Should you be worried that a Wheelys bike is going to come along and steal your custom? Well, the one thing Wheelys lack is the one thing you’ve got: comfort. Wheelys bikes lack any seating or comfort for customers, whereas you have cosy chairs, heating and tables for customers to enjoy their drinks and perhaps write the next best-selling novel. And enjoying a coffee with a group of friends is considered a social event. With Gen Z spending 7.6 hours a day on average socialising with their friends and family, they’ll be looking for a place to sit, relax and create memories. And don’t forget the power of social media for cafes, pubs, restaurants and bars. A quick search for ‘cafe’ on Instagram shows over 18.5million posts for #cafe and a staggering 55.6million posts for #coffee. Creating a social media presence is much easier for a brick and mortar shop. 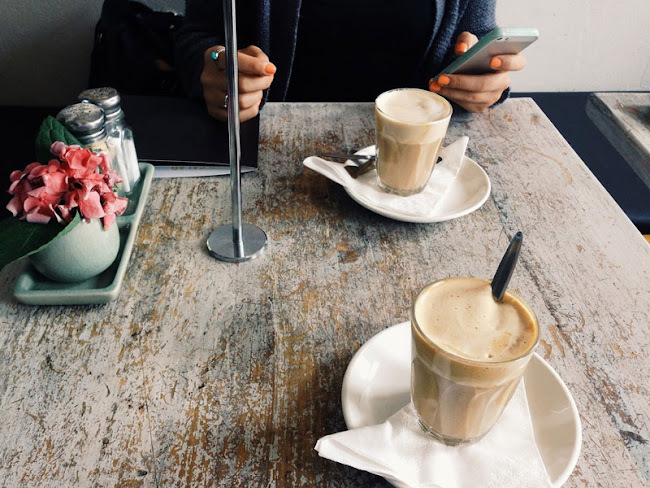 Your cafe doesn’t move and you have the ability to offer deals for returning customers via Facebook and Instagram campaigns. You can even offer free wifi, something Wheelys Cafe’s will struggle to do. There are pros and cons to the Wheelys way of life. And just like Uber now dominates taxi rides or how Deliveroo has cornered the premium take-away market, Wheelys are shaping up to take on the big-players in coffee. Are you interested in becoming a ‘wheeler’? 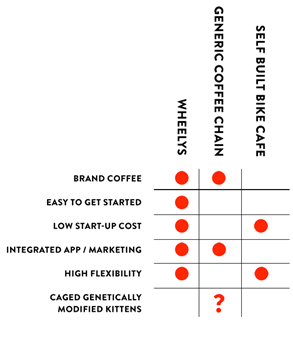 Or do you think the new wave of bike-borne coffee will have an impact on your business? Let us know in the comments below. And don’t forget to stock up on your coffee shop supplies today. Want to read more about coffee? Find out how to choose the right blend of coffee with our last blog.